What If Dinosaurier Were Still Alive Today? One Tag Dinosaurier mysteryiously come back to life (tissue and every thing) And your forced to kill them, Whitch on would be would be easier to kill? I Liebe ALL Dinosau- rs!!! Some Dinosaurier which appeared in Jurassic Park series. Which is your favorite? Which would win in a fight to the death, Tyrannosaurus Rex oder Triceratops? What is your Favorit Dinosaur ? Have Du ever wanted to find a cryptid dinosaur? the Kasai Rex (a cousin to T-rex. )or Mokele Mebembe (a cousin to the brontosaurus.)? I can't decide weather to be a T-rex oder a Spinosaurus altough I think both of them are cool. Give me the advantages and disadvantages of bieng a T-rex and do the same thing for Spinosaurus. Pachycephalosaurus means "thick-headed reptile," due to the domed and hugely thickened bone on the oben, nach oben of its skull--like a cyclist's crash helmet. 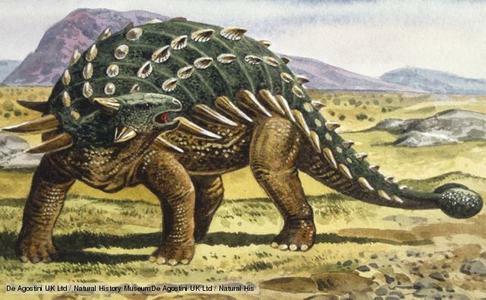 Stegosaurus was about 25-30 feet long from nose to tail and probably weighed Mehr than 2 tons. According to some experts, Ornitholestes may have had a slight ridge oder crest on its nose. Other experts disagree. Pikaia was the first known chordate. All backboned Tiere belong to this group as well as marine Tiere called tunicates and acraniates. Vascular plants are Mehr suited to living on drier land than mosses and liverworts. These stems and walls also mean the plants can stand tall. Vascular plants have spores (reproductive cells, like seeds)-the taller the plant, the Mehr widely it can disperse its spores. These Dinosaurier were small-to-medium meat eaters with sharp teeth and claws. They ran quickly on their two longer back legs . Fossils of Herrerasaurus datum from 228 mya and were found near San Juan in Argentina, South America. Hemicyclaspis had eyes on oben, nach oben of its head. This suggests it lived on the seabed and used its eyes to keep a look out for predators above. Another difference between jawed and jawless fisch was that jawed fisch had a pair of nostrils, while jawless fisch had just one. It contains chlorophyll and was the first living organism to use photosynthesis oder make energy using sunlight. Over millions of years, the algae was able to produce enough oxygen to help Mehr complex organisms to evolve. a comment was made to the answer: I don't know why but I Liebe Dilophosaurus!